"To preach the gospel in the regions beyond you". These words, while they set forth the large-heartedness of the self-denying and devoted apostle, do also furnish a fine model for the evangelist, in every age. The gospel is a traveler; and the preacher of the gospel must be a traveler likewise. The divinely-qualified and divinely-sent evangelist will fix his eye upon "the world". He will embrace, in his benevolent design, the human family. From house to house; from street to street; from city to city; from province to province; from kingdom to kingdom; from continent to continent; from pole to pole. Such is the range of the "good news" and the publisher thereof. "The regions beyond" must ever be the grand gospel motto. No sooner has the gospel lamp cast its cheering beams over a district, than the bearer of that lamp must think of the regions beyond. Thus the work goes on. Thus the mighty tide of grace rolls, in enlightening and saving power, over a dark world which lies in "the region of the shadow of death". It spreads from pole to pole." 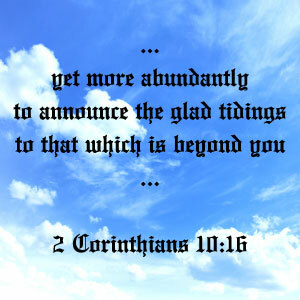 Christian reader, are you thinking of "the regions beyond you"? This expression may, in your case, mean the next house, the next street, the next village, the next city, the next kingdom, or the next continent. The application is for your own heart to ponder: but say, are you thinking of "the regions beyond you"? I do not want you to abandon your present post at all; or, at least, not until you are fully persuaded that your work, at the post, is done. But, remember, the gospel plough should never stand still. "Onward" is the motto of every true evangelist. Let the shepherds abide by the flocks; but let the evangelists betake themselves hither and thither, to gather the sheep. Let them sound the gospel trump, far and wide, o'er the dark mountains of this world, to gather together the elect of God. This is the design of the gospel. This should be the object of the evangelist, as he sighs after "the regions beyond". When Caesar beheld, from the coast of Gaul, the white cliffs of Britain, he earnestly longed to carry his arms thither. The evangelist, on the other hand, whose heart beats in unison with the heart of Jesus, as he casts his eye over the map of the world, longs to carry the gospel of peace into regions which have heretofore been wrapped in midnight gloom, covered with the dark mantle of superstition, or blasted beneath the withering influences of "a form of godliness without the power". It would, I believe, be a profitable question for many of us to put to ourselves, how far are we discharging our holy responsibilities to "the regions beyond". I believe the Christian who is not cultivating and manifesting an evangelistic spirit, is in a truly deplorable condition. I believe, too, that the assembly which is not cultivating and manifesting an evangelistic spirit is in a dead state. One of the truest marks of spiritual growth and prosperity, whether in an individual or in an assembly, is earnest anxiety after the conversion of souls. This anxiety will swell the bosom with most generous emotions; yea, it will break forth in copious streams of benevolent exertion, ever flowing toward "the regions beyond". It is hard to believe that "the word of Christ" is "dwelling richly" in any one who is not making some effort to impart that word to his fellow-sinners. It matters not what may be the amount of the effort; it may be to drop a few words in the ear of a friend, to give a tract, to pen a note, to breathe a prayer. But one thing is certain, namely, that a healthy, vigorous Christian will be an evangelistic Christian  a teller of good news  one whose sympathies, desires, and energies, are ever going forth toward "the regions beyond". "I must preach the gospel to other cities also, for therefore am I sent" (Luke 4:43). Such was the language of the true Evangelist. It is very doubtful whether many of the servants of Christ have not erred in allowing themselves, through one influence or another, to become too much localized  too much tied in one place. They have dropped into routine work  into a round of stated preaching in the same place, and, in many cases, have paralyzed themselves and paralyzed their hearers also. I speak not, now, of the labors of the pastor, the elder, or the teacher, which must, of course, be carried on in the midst of those who are the proper subjects of such labors. I refer more particularly to the evangelist. Such an one should never suffer himself to be localized. The world is his sphere  "the regions beyond", his motto  to gather out God's elect, his object  the current of the Spirit, his line of direction. If the reader should be one whom God has called and fitted to be an evangelist, let him remember these four things  the sphere, the motto, the object, and the line of direction, which all must adopt if they would prove fruitful laborers in the gospel field. Finally, whether the reader be an evangelist or not, I would earnestly intreat him to examine how far he is seeking to further the gospel of Christ. We must not stand idle. Time is short! Eternity is rapidly posting on! The Master is most worthy! Souls are most precious! The season for work will soon close! Let us, then, in the name of the Lord, be up and doing. And when we have done what we can, in the regions around, let us carry the precious seed into "THE REGIONS BEYOND". From Papers on Evangelization, chapter 2.